Thanks for visiting our surgery website where we hope you will find a user-friendly layout and a wealth of information about us. Use the buttons above and "Quick Links" to the right to find out when we’re open and what to do when we’re not, learn about our services and ethos, and catch up on our latest news. We are a welcoming practice and we strive always to provide the best possible care for our patients, with a smile. Not only do we do everything you would expect of a normal GP surgery, we also offer a range of other specialist clinics - see Clinics and Services. If you need to see or speak to someone, we won't ask you to "call back at 8.30 tomorrow" - during a normal working week you will always be able to talk to a Doctor or Nurse Practitioner the same day. They may be able to sort things out over the phone, but if not, then you will get an appropriate appointment quickly. We have a free-for-patients car park and an attached pharmacy operated by Boots. All of our consulting rooms are disabled accessible and we have a lift servicing the upper floor. 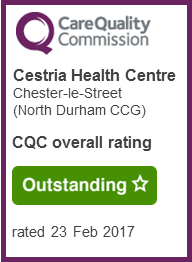 We are delighted to have been rated Outstanding by the Care Quality Commission. See our report here. Our registered patients can order a repeat prescription, see their medical records, and book a surgery appointment or Doctor/Nurse call back time online. For security and confidentiality reasons these services are password protected. 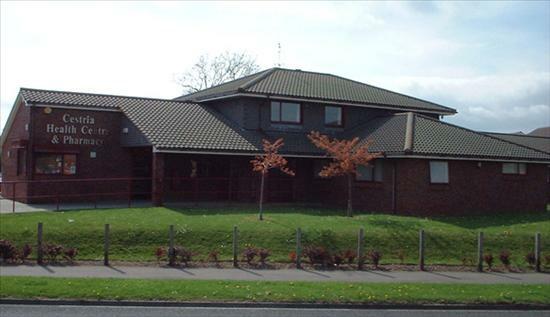 You can either call Reception for further details - 0191 3887771, or click on the Prescription or Appointment boxes towards the bottom of this page, and follow the on-screen instructions. For new online users, please click here to register. We love to hear from our patients, sending us your comments is also just a click away. If you’re not yet a patient here at Cestria, but would like to be, you can download the necessary forms here. Please check our practice boundary first, see under "New Patients" on top menu bar.